Well, here we are with part 2 of the week's round up. Not much variety in the ratings this time around - four very good movies, with A History of Violence just doing enough to reach the lofty heights of a '9' grade. I have to confess that I absolutely loved this film when it first came out. I know a lot of people thought it was terrible, I know it was directed by Zack Snyder, but despite those significant handicaps, I came out of the cinema dazzled. However, my initial goodwill towards the film was whittled away by reading a torrent of negative comments about the film on the internet, and by the poisonous critical reception given to Snyder's follow up movie, Sucker Punch. 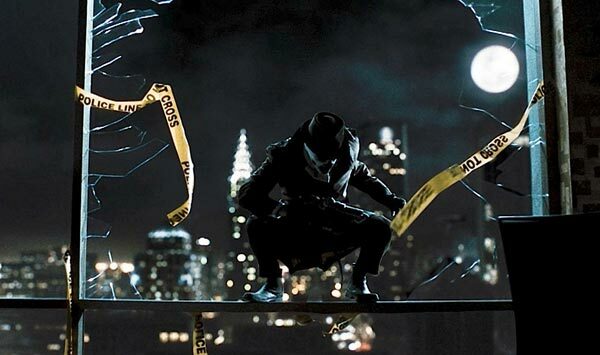 So, it was with some degree of trepidation that I decided to play the DVD of Watchmen; would it be as good as I remembered, or were the naysayers right? I suppose the truth is somewhere in between, but I still think Watchmen is much more interesting than the vast majority of superhero pictures to have come out in recent years. It is mostly successful in mixing together real world history with a fictional narrative in which superheroes have been protecting the streets of New York since the 1940s. It is also a visually beautiful film, with some dazzling uses of special effects, paticularly some of the sequences featuring the blue tinged atomic superman, Dr Manhattan. The plot, which is copied almost exactly from Alan Moore's brilliant comic book is full of twists and turns, and despite the two and a half hour running time, I never found myself bored with the film. I think the problems with the movie stem from some poor acting on the part of a few of key performers (I'd single out Malin Akerman and Matthew Goode for particular opprobrium here; conversely, Jackie Earle Harley is terrific as Rorschach), as well as a slightly weak ending. Still, on the whole I'm still pretty happy to stand behind the film as being one of the best superhero movies of the last ten years, not quite up there with Christopher Nolan's Batman movies, but certainly in the conversation. This movie, like The Day The Earth Stood Still last week, was playing as a Sunday matinee showing at the local arthouse cinema. The plotline centres on the actions of an embittered, violent New York cop named Jim Wilson. Wilson spends the first half of the movie engaging in some strongarm tactics in an effort to track down two men suspected of killing another police officer. After his captain has had enough of his brutal methods, is sent upstate to get his head together (rather like Johnny Ryall). 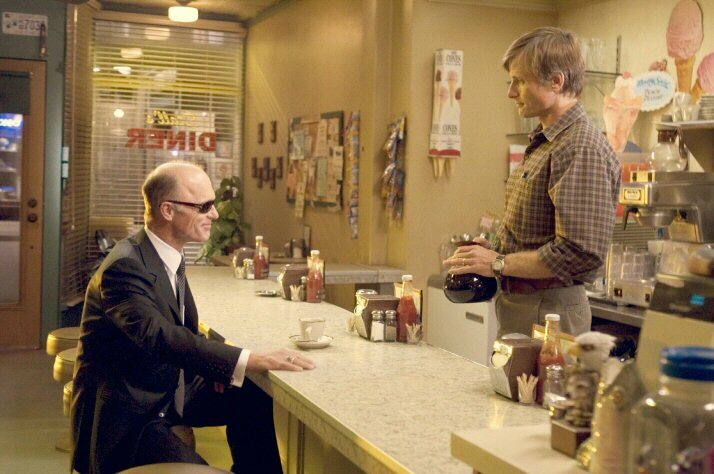 Rather than drinking some Thunderbird and feeling light as a feather, Wilson is instead ordered to assist the smalltown cops in the investigation into the killing of a young girl. On the trail of the killer, he is partnered up with the father of the girl, who is determined to kill the perpetrator before the police can arrest him. The duo track down the killer's movements to a farm, where he is being harboured by his sister, a stoical blind lady. 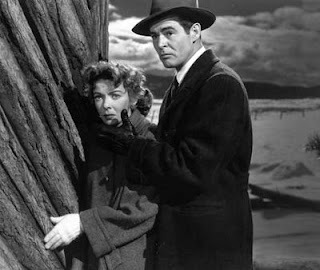 It was rather interesting to see New York in a film noir from this era - most of the movies in genre which I've seen (such as Double Indemnity, have been set in Los Angeles. It creates a very different atmosphere - the dark streets and alleyways in the first half of the film are very different from the broad, palm fringed boulevards of LA, and the snowy vistas of upstate NY contrast strongly with the sundrenched Californian hills. The film was divided into two very distinct halves - the first of which, on the mean streets of New York, I felt was very effective, showing the rough and tumble lives of the NY city cops, and how the demands of the job took its toll on the already fragile psyche of Wilson. However, the second half was a little less effective - Wilson's lengthy conversations with the murderer's sister stalled the momentum of the movie, which had until that point been told at a breakneck pace. Nevertheless, a very solid and entertaining film noir. One of two recent forays by David Cronenbourg into movies examining the violent lives of gangsters (the other, Eastern Promises, also features Viggo Mortensen in a lead role). The film is initially set in smalltown Indiana, where Tom Stall (Mortsensen), the mild mannered owner of a local diner, seems to be living the American dream. He has a beautiful wife, two polite and intelligent children and the respect of the local community as the owner of a thriving business. However, after Stall intervenes in a robbery at his diner, saving the lives of a number of his customers and employees, he gains some unwanted national fame - which draws him to the attention of men representing the violent life he thought he had left behind. Rather like David Lynch, Cronenbourg takes great pleasure in showing the darkness that often lies beneath the seemingly normal American family. The violent setpieces are very well staged, and do not shy away from showing the gruesome end results. Mortensen is particularly good in the lead role, as his character gradually changes from the gentle family man he is in the beginning, to the dead eyed killer he regresses into. Top notch. A classic '80s movie, which deftly mixes comedy, horror and sci fi elements. Ghostbusters stars Bill Murray, Dan Aykroyd, Harold Ramis and Ernie Hudson, who team up to do battle with the hoardes of paranormal beings attacking New York. But of course, you knew that anyway. 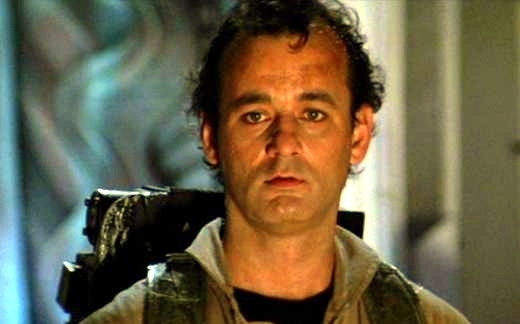 For me this film is all about Bill Murray. Pretty much every line which comes out of Murray's mouth is pure gold - even where what he's saying isn't all that funny, his deadpan, laconic drawl really sells it. Other highlights include a decidedly foxy Sigourney Weaver as Murray's love interest and Rick Moranis as a nebbishy accountant in Weaver's building. Apparently, they're making Ghostbusters III at the moment, though I don't want to get my hopes up too high - it could be Indiana Jones & The Kingdom of the Crystal Skull all over again.